I've got a client coming over this morning, so instead of making snarky comments about Edwards and Guiliani dropping out of the race (Yeah, like you didn't see that coming) I'll be out in the shop for a while. This is a bit different from my usual work. 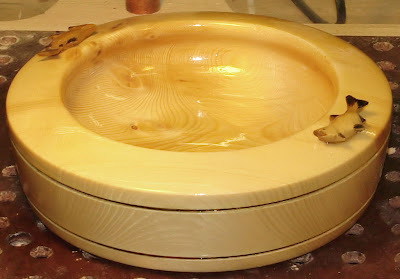 First, the bowl itself is turned from Sitka spruce and not green birch. This particular piece is turned from wood harvested from a beetle-killed tree that had been dead and standing for several years, and as such was extremely dry. Dry Sitka spruce is a pain to turn, it's a softwood that has very long, very tough fibers - perfect for building material, but not much fun to turn (though it smells great when you're making saw dust from it - kind've a clean, crisp pine scent). Because it's a pain, I don't usually work with it. However, this particular piece was done on commission and the client specified the material, shape, and design. Hey, if you're paying me, you can have it your way. 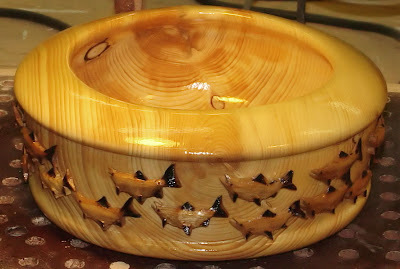 The fish are carved from birch and the bowl is finished in tung oil and an acrylic glaze. I like the tung oil finish as it gives the spruce a warm, yellow brown tone. Both of these bowls are turned with thicker walls and bases than if they had been made from birch. This keeps the bowl from deforming and provides strength, which is important in bowls intended for use rather than display. You are definitely an artist, Jim. That's beautiful. Excuse me for wearing the "whiney git" hat in the group, but I'm pretty sure you said you'd offer up some of your work for sale after the first of the year. I want to pay you, but you're making it difficult. Beastly, Zebrawood sounds interesting...why don't you e:mail me a pic? Jim, you are so not off the hook. 'Cause I want one with an ornament. All, thanks. I'd blush, but I not built that way. I'll just have a beer and say thanks again. Michelle, This isn't remotely my best work, in fact I consider this fairly pedestrian. But it's what the client wanted, so there you go. Shawn R. (Beastly): You're crowdin' my game, Man! Kidding, of course. Beastly is my woodworking partner and good friend. He is currently refinishing several thousand square feet of yellow pine floor in a railroad museum in Salmanca NY. But because 12 hours a day on hands and knee sanding the floor isn't enough wood work for him, he also go home and does more as a hobby. His bowls are most excellent. He works in exotic hardwoods and makes many beautiful and wondrous things, all of which are for sale. If you're interested, email him or comment here, and he'll send you pictures - then you can all haggle over the price. I keep telling him to put some pix on his site, but apparently 16 hours of woodwork a day leaves little time for blogging. Big Baby. Truly lovely. I love to look at it. I'm not going to buy it, though. Could you like me anyway?